While thinking of Bhutan, the first thing that comes to mind is its ornately decorated monasteries, the colourful fluttering flags, it`s spicy cuisine and masks dance festivals. But besides all these, one key factor that contributes to its growing popularity is the country`s famous adventure sports such as trekking, mountain-biking, mountain-cycling, hiking, white-water rafting, and kayaking, etc. Punakha, the former capital of the Himalayan Buddhist kingdom- Bhutan is an outstanding tourist destination which invites countless tourists every year. This quaint city is a treasure trove of some alluring landscapes which attributes to the serenity of mountains and roaring hills, lush- green rain-washed slopes, magnificent dzongs and furious rivers. It is the home to Bhutan`s second largest and oldest Punakha Dzong which is located at the confluence of rivers Po Chu and Mo Chu. Po Chu and Mo Chu are the two major rivers which offer wide opportunities for the travelers to raft through its rapid trails. River Po Chu stretches for approximately 16 km course with about 15 rapids of class 2-4 and river Mo Chu has a 10 km course with 10 rapids of class 2-2+. Thus, with the reference of rafting experience in these two main rivers, most tourists have also designated Po Chu as the Male River with regard to its high rapids and the little calm and gentle Mo Chu as the Female River. Punakha river rafting not only takes you to an adventurous river trip but also allows you to delve into the valley`s most scenic and appealing landscapes featuring the flawlessly flowing blue water, charming view of the world`s rarest birds, captivating alpine scenery and the magnificent sight of the centuries-old Punakha Dzong. There are several rafting companies and tour operators in Bhutan which specializes in organizing be-spoken rafting itineraries. 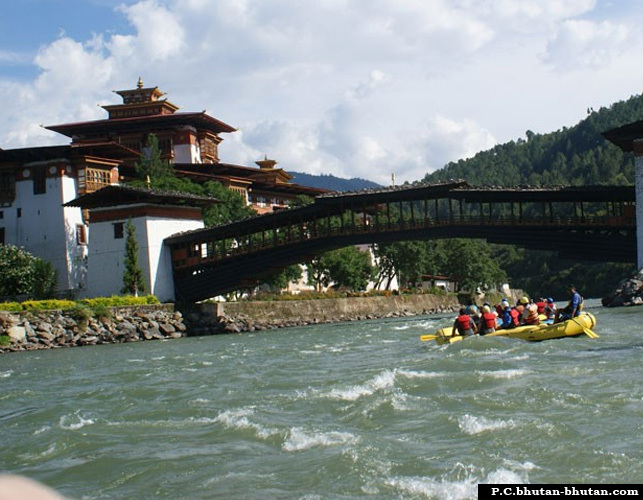 Starting from arrival and adventure to departure, rafting in Punakha itinerary also includes accommodation in top hotels and sightseeing of the Bhutan wonders too. They also provide an experienced guide who will guide you throughout the river trip and also give you some related information and tips. Though rafting in Punakha can be enjoyed throughout the year but considering few facts like weather condition and temperature of water, the best rafting season in Bhutan is March to May and September to November. Most travelers generally view in their mind that rafting in Punakha is quite expensive but this is totally wrong. There are Bhutan rafting service providers who conduct rafting trips in many places of the kingdom and the prices are also quite reasonable. 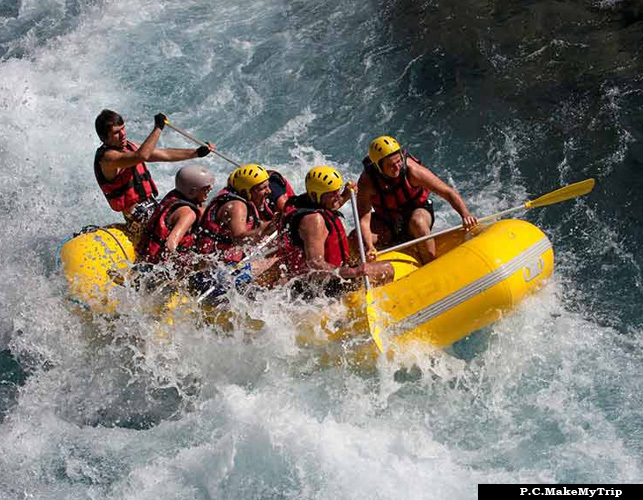 Cost of rafting in Punakha, Bhutan is completely dependent upon the seasons. During peak seasons, it costs Nu.2000 to Nu.2500 per head whereas, during the off-seasons, the price falls to Nu.1000 to Nu.500 per head. 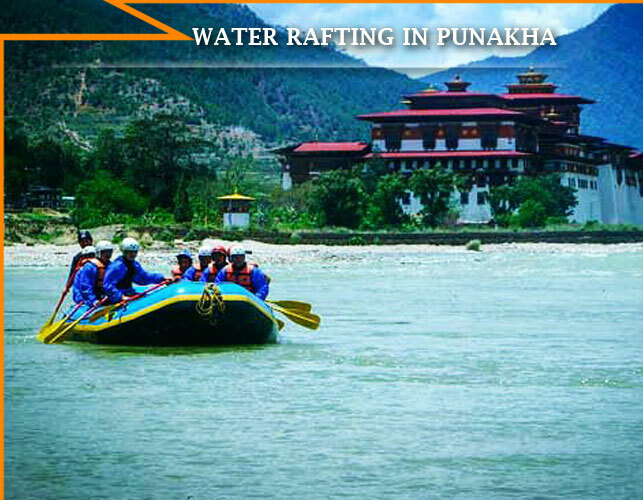 Punakha is an ideal place to quench the wanderlust of adventure lovers as well as nature admirers because the rugged and untamed waterways of the valley have so much to offer to its visitors in order to justify their trip.